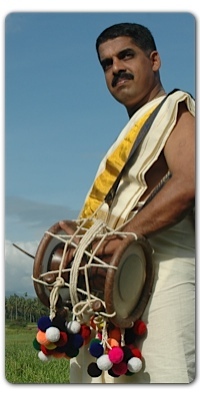 My homepage is devoted to the melodious drum of Kerala known as idakka, edakka and edaykka. On account of its versatilily, this instrument became indispensable in Kerala's temple music many centuries ago. The same applies to the region's dance and drama such as Mohiniyattam, Kutiyattam, Nangiarkoothu and Kathakali. Preserving the dignity and integrity of the musical tradition of my musical ancestors and fellow practitioners is therefore my first priority. My research aims at enlarging the expressive scope and technical possibilities of the idakka in other contexts. This will enable future generations to enjoy this music as part of their living cultural heritage. Today the idakka plays a role in the cultural exchange with artists from different parts of the world. Several collaborations in the fields of art and education offer junior and senior listeners a new kind of musical experience. Please feel free to contact me for inquiries regarding the instrument, performances, special compositions, lecture demonstrations, courses, workshops, and joint recordings in or outside India.